When you’re caring for an elderly loved one, stress can build slowly or it can hit you very quickly. Phone calls, appointments, and even the mail can bring frustrating news that you have to deal with right then. All of these situations can bring on serious stress than can affect you now and in the future if you don’t deal with it. Here are some tricks you can use to defuse stressful situations quickly. As soon as you realize that you’re stressed out and tensed up, consciously make an effort to relax your body. This may involve taking a second to close your eyes, breathe deeply, and just let everything go. Try shaking your arms and legs to loosen the muscles if you need to. If you can consciously make your muscles more relaxed, you’ll be amazed at how your stress levels can drop, even if it’s only a little bit. Negative thinking really does a lot to keep stress rising. Do everything that you can to rephrase negative thoughts into positive ones. At first you might feel like you’re faking it, and you might be. But after some more practice, you’ll find that it’s easier and easier to rephrase negative situations and thoughts into more positive ones. Caregivers are infamous for trying to do everything by themselves. The problem is that this type of attitude just ratchets stress higher and higher. The best way to combat this problem is to get additional help. This can take all kinds of forms from friends and other family members who are able to pitch in here and there all the way to senior care providers who are able to take on some of the heavy lifting. When you’ve got people you can count on, you can call them in with short notice when you need help. These fast techniques work well in a pinch, but if you really want to reduce your stress levels, then it’s time to start using stress relieving strategies more often. Meditation, yoga, and even just spending quality time on your own can all go a long way toward keeping you in a lower gear when it comes to stress. Keeping your stress levels in check helps you and it ultimately helps your loved one, too. 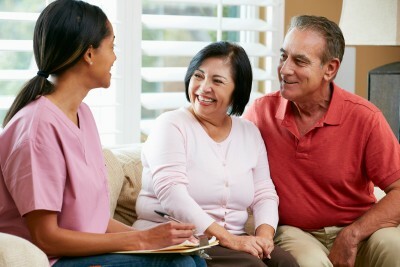 If you or an aging loved one are considering senior care in Middletown, NJ, please contact the caring staff at Lares Home Care 1-800-781-7435 or 732-566-1112.